Refreshing Daily in God's Word: Daily Devotion: Did You Know About Investments? Daily Devotion: Did You Know About Investments? America’s foremost humorist was a bit of a sucker when it came to investing in other people’s inventions, but he somehow managed to turn down a stock offering in the telephone from Alexander Graham Bell. Twain wrote: “I said I didn’t want anything more to do with wildcat speculation. Then he (Bell) offered the stock to me at twenty-five. I said I didn’t want it at any price. He became eager; insisted that I take five hundred dollars’ worth. He said he would sell me as much as I wanted for five hundred dollars. 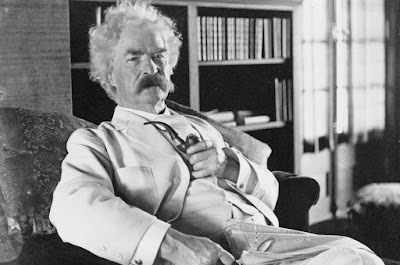 But I was the burnt child, and I resisted all those temptations, resisted them easily; went off with my check intact, and next day lent five thousand of it, on an unendorsed note, to a friend who was going to go bankrupt three days later.” The small investment Bell was seeking would have earned Twain $190,000. That would be equivalent to several million dollars today. But there is a greater investment and that is investing our lives and our finances into God’s “heavenly work.” One day we will get our “investment check” which will be far greater than any earthly investment. ✞ Those who invest in the heavenly will receive a “higher” return on their investment. Daily Devotion: Do You Know About Louis Adamic? Daily Devotion: Do You Know About These Heroes? Daily Devotion: Do You Know About Captain Jouett? Daily Devotion: Do You Know About This Battle? Daily Devotion: Did You Know About These Dates? Daily Devotion: Did You Know About Wind Wagons? Daily Devotion: Did You Know About Cabbage Patch? Daily Devotion: Did You Know About Joe Knowles? April 2019: Do You Know?